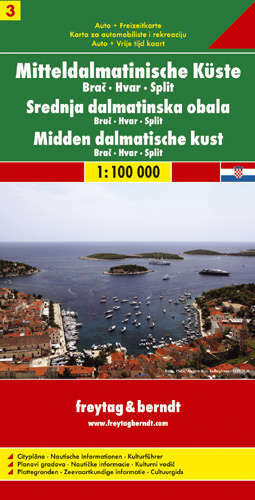 The Dalmatian Coast of Croatia from Split southwards to Gradec on a detailed map at 1:100,000 from Freytag & Berndt with large icons indicating various facilities including campsites and beaches, ferry connections, etc. Coverage includes the islands of Brac, Hvar, Vis, Korcula and Lastovo, plus the northern part of the Peljesac peninsula. The map shows local roads and indicates ferry connections. Icons mark various facilities such as campsites, beaches and marinas, as well as places of interest. Map legend includes English.